Gods this is such a great series. I’m sorry that it’s only a trilogy but Rick being Rick did leave it open that if he wants to he can always return to Vahalla, Magnus Chase and his friends. I’ve gushed and praised Rick Riordan in so many other reviews and this is another one. His ability to mix mythology, humor and present day is truly a gift. Yes, his these books a little formulaic. His heroes must go on epic journeys, where they must face many dangers and trials before facing a near impossible task but never does it feel tired or old. It maybe because of his cast of characters are all are real and diverse. How many young reader novels has a Muslim and gender fluid characters in the same novel? and more important how many of them are both are shown to be brave, resourceful, loyal, smart, funny and happy. The answer not many. Both Samirah and Alex are all of those and more. Throughout the entirety of the book Sam is practicing Ramadan, which is probably the first time that many of readers have ever read about Ramadan. As I have stated before about Rick’s, he’s not afraid to tackle tough subjects in his books and he does it by showing positive scenes and connecting them with the stories of our past. That no matter what a child is going through, they are not the only ones. Kids of all race, gender identity and faith can see themselves in one of his many books and that’s amazing. So keep up the good work Rick! I keep waiting for Rick Riordan to write a bad book. The Dark Prophecy is not that book. He just keep coming up with fresh and different ideas of making these old stories relevant and fun. Whoever is the God or Goddess of story telling, Rick Riordan is their son. When we last left Apollo, he’s reeling from the betrayal of Meg, a new prophecy sending him to Indianapolis and the reappearance of Leo and Calypso. That’s a lot for a former God turned mortal teenage boy to handle but handle he must. When Apollo, Leo and Calypso arrive they are greeted by some very polite monsters because of course the monsters that inhabit the Midwest would be polite. they are rescued by two former Hunters of Artemis Emmie and Josephine who tells them that their daughter is missing. She had gone to the dark oracle for help from the second Emperor who has made Indianapolis his home. Of course this Emperor Apollo has personal history with making everything more awkward. As the crew tries to figure out how to defeat Emperor Commodus and get the next prophecy without going crazy they experience the same mythic hi-jinks of the other books. Yes, these book can at times feel be formulaic but it never feel feels like that. They are just fun, witty and refreshing. Rick doesn’t shy away for the more uncomfortable stories from Greek and Roman mythology or tries to wash them out either. Many of these stories are not happy or fun but then again neither is life and yet Rick never lets it get to dark. He is always able to find the absurdity in them. Bring on the next one. Happy One Year Anniversary to The Raven King and Maggie Stiefvater! April 2016 was our most successful month page views wise. We had 589 views, which beat our previous record of 552 in December 2015. It made me wonder what were we writing about a year ago to get so much traffic. Well, The Raven Cycle and Maggie Stiefvater. It’s hard to believe that the The Raven King came out a year ago. That it has been a year since we found out if Gansey, Blue, Ronan and Adam would find the sleeping Welsh King and If Blue and Gansey would kiss and if Gansey would die. Those mysteries have been solved. Thankfully, we know that we haven’t read the last of the Gang as Maggie is working on a trilogy about Ronan. Whee!!! My editor is going to hate me, but I just outlined three books for a Ronan-centered trilogy. And we have another Maggie book coming in October. So we have a lot to look forward to but let’s take a moment, in honor of the 1 year anniversary of the release of The Raven King and the end of the The Raven Cycle, to look at everything we have ever written about the series. Countdown to The Raven King! SQUEE! This is the most fantastic news! I’m so happy that it’s being adapted for TV and not a movie because a 2 hour movie could never hold the likes of Gansey, Blue, Ronan, Adam and Noah. This would be perfect for as a Netflix show or even maybe AMC. I just hope they do it justice. Thanks to Library-Mermaid on Tumblr for the gif. It was worth the wait. I really love Lish McBride’s writing. It’s fast paced and full of humor and just so wonderful. Pyromantic begins a month or two after Firebug ended. Ava and Cade are trying to figure out their relationship now that they know they are daughter and father. Ava is still smarting from turning down Lock for a date. Ava is still coterie but she can’t quite figure out her new boss, Alistair. Like, when is he going to start killing people for no reason because that’s what Coterie does, right? Let’s just say there is a lot to get used to. That’s when this strange and unpredictable things start happening that Ava, Lock, Ezra, Sid and Bianca now must investigate. I love Ava. She’s funny, sarcastic and a little cynical. She is full of insecurities and considering everything that she has been through it’s not surprising. She lost her Mom after years of being on the run. She is forced to work for Venus and the Coterie like an indentured servant. She doesn’t have many friends outside of her team Lock and Ezra and Sylvie, who works at Cade’s bookstore. When Lock asks Ava out it throws her off. What if they break up? How will that effect that their friendship? So she avoids them both Lock and Ezra. When the strange a disease ravages the area they are forced to work together. After all the twists turn it makes for a great book. It’s so different. I mean who doesn’t love Kelpies who wear sweaters? Or Werehares who knit and in a biker gang? I love it all. But most of all I love the friendship between Lock, Ezra and Ava. They is a true sense of family with them. They love each other and they are there for each other. They tolerate each other faults and support each other when they are down. I’m also loving the friendship of Ava and Sylvie. They are both polar opposites. Sylvie is all sunshine and rainbows and Ava is just fire but it works. I’m know vague on the plot points but this was a wonderful sequel to a great book. I really hope you all go out and support Lish because she really writes some amazing stories that are weird and funny. I’m not sure what else to say but go read! Just finished Firebug and there was so many things I forgot that makes so much more sense in Pyromantic. 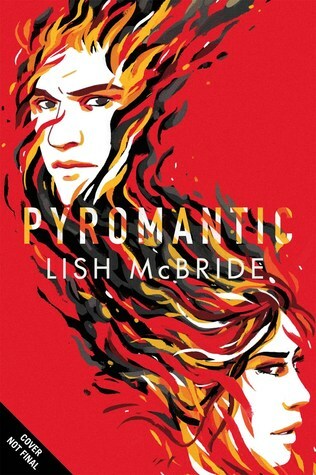 By the way Pyromantic comes out on Friday may I suggest you pick up both this weekend. I’m prepping for the release of Pyromantic by going back and rereading the first book in the series, Firebug. If you haven’t read it, I highly suggest you do! Well this is a game changer for the series. We are getting to the Prisoner of Azakaban territory as we begin to expand the world and up the stakes. Paige is now the Underqueen of the Unnatural Assembly but when Jaxon jumps over to the Rephaim side, she’s blindsided. Not only does she have doubts about her abilities, her mentor is working with the enemies, giving them all of their secrets. The Mime-Order’s partnership with the Ranthen is tenous at best. She must first prove to the voyants that she is worthy to follow and to the Ranthen’s that she worthy to be funded. After a disastrous mission to take down senshield, a device that can detect the auras of Voyants, Paige takes off to investigate leads in Manchester. Trying to stay ahead of the evil military mastermind, Vance. Nothing has been easy for Paige and that is definitely true but she really comes into her own. Paige very much wants to what’s best for the voyant community and end Scion but she has to combat so many things. She has to prove her worthiness to her people and to Ranthens. Making things complicated is Jaxon, who many people still support and don’t believe that went over to the Scion. Others see Paige’s youth as another drawback. When Paige makes the mistake of acting on unproven intel and that makes sensheild even stronger, she has to move everyone underground. Paige may not see it at the point but I think this was a pivotal point for her. It proved her willingness to make the hard decisions but also it outsmarted her enemies. Jaxon admits that even he couldn’t figure out where they disappeared too. As the story plays out, we see more and more of cruelty of the Scion and how it’s not just the Rephaim who are committing it. The introduction of Vance is an example of a human doing unspeakable things on other humans for advancement or for their own enjoyment. It almost seemed like Vance sees her role as more of a game then anything else. To me that makes her scarier then the Rephaim. Samantha Shannon is getting better and better with each book. It’s almost as a writer she is learning more about herself, as Paige is doing the same thing on the page. The ending leaves as many answers as it does questions but also opens us to even more possibilities. I will do my best wait patiently for book 4.